The last several weeks have been filled with several tragic workplace violence incidents outside of Detroit, at the Unviersity of Wisconsin, at CNN and the Virginia Tech massacre which have been all over the news. I know that all of us in the background screening industry extend our sincere condolesences to all the familiies of the victims in these tragedies and others that may not have made the news. The Virginia Tech tragedy may very well serve as water shed event to stimulate more attention to the growing problem of workplace violence and the need for aggressive prevention measures such as background screening. We are in an industry that can make a difference and save peoples lives. I encourage each of you and your organizations to do all that you can to spread the word of prevention and to help organizations position themselves so that we can put an end to these tragic, senseless and horrific incidents. PreemploymentDirectory.com the preeminent source for employers to find background screening resources on the Internet has join forces with BRB Publication’s Public Record Retreivers Network The dominant online portal for the public records industry to make public records retrievers contact information available thru PreemploymentDirectory’s Vendor Showcase. 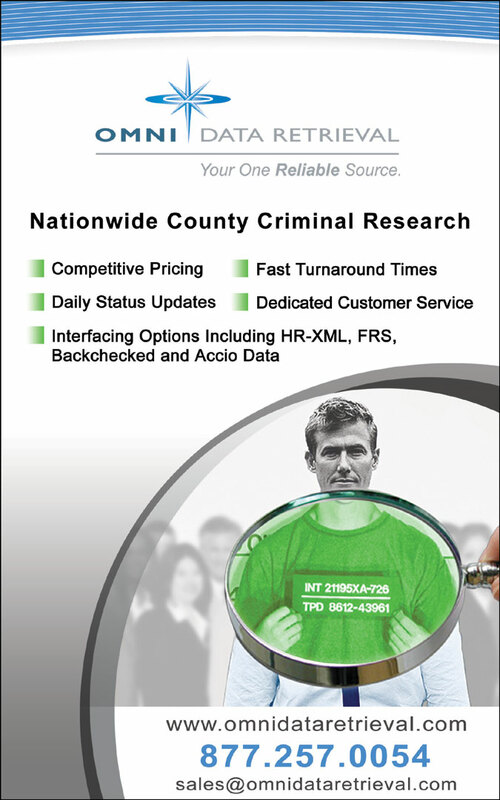 This will dramatically increase the visibility of public records retrievers, legal and investigative professionals. ARRESTFREE.COM has released the 1st ever website solely dedicated to removing minor arrest offenses by providing expungement serviceS. By combining innovative technology and the latest U.S provisions on expungement policy, ARRESTFREE's revolutionary approach plans to clear over 1 million users' arrest records now eligible under new laws across the U.S. The initial launch took place in the state of Illinois. ARRESTFREE.COM will provide people a meaningful avenue to maximize their chances of re-establishing a solid reputation in their career and community. 10% of ArrestFree.com’s profit goes back into the community it serves with employment, expungement and training sponsored events as part of its mission of expunging 1million eligible citizens arrest records across the U.S.
How up-to-date are your security standards? British Standards has now published the replacement to BS 7858:2004 - BS 7858:2006 Security screening of individuals employed in a security environment. Code of practice BS 7858:2006 gives recommendations for the security screening of individuals to be employed in an environment where the security and safety of people, goods or property is a requirement of the employing organization’s operations and/or where such security screening is in the public interest. ROSELAND, NJ--(MARKET WIRE)-- ADP® Employer Services (ES), a division of Automatic Data Processing, Inc. (NYSE:ADP - News), a leader in outsourced payroll, HR and benefits administration solutions, has released its annual Screening Index, a yearly evaluation of employment screening and hiring trends. Last year alone, ADP Screening and Selection Services conducted 5,815,511 background checks, a nearly 20 percent increase over the previous year. This year marks the 10th anniversary of ADP's annual Screening Index. The results of the 2007 Screening Index reveal that organizations continue to see the importance of background screening. As the industry evolves, employers are increasingly adopting processes to automate applicant screening and evaluation to save time and resources while ensuring a safe and trustworthy workforce. Falls Church, Va.,– USIS, the leading provider of background investigations to the federal government that has more investigators in the field than any other company in North America, has developed a case management and tracking system aimed at helping to eliminate the current backlog and timeliness challenges impacting the federal security clearance process. 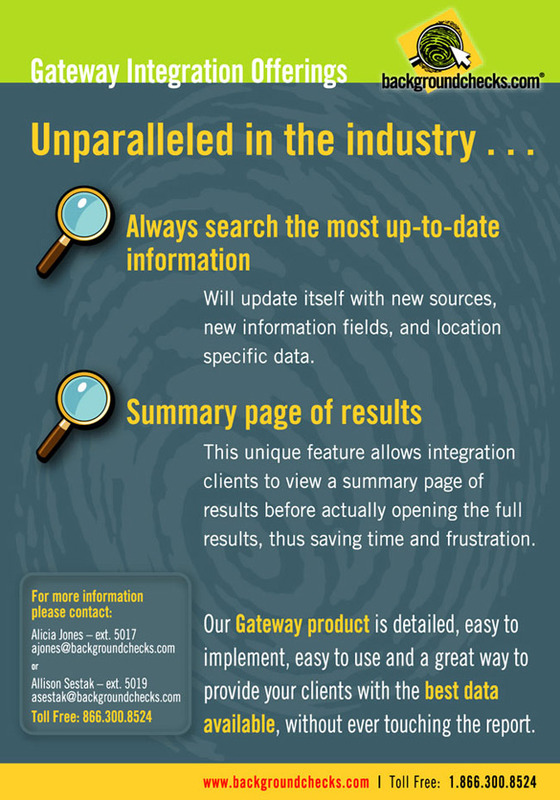 Catalyst was developed by the company to continue to demonstrate to U.S. government agencies that background investigations can be done quicker and more cost effectively than the current security clearance case management system. Following a successful pilot program and testing phase, USIS is now using Catalyst with its federal customers other than OPM as a replacement for older systems that are redundant and costly to maintain. USIS used its subject matter experts from IT, data entry, field investigations, case review, and quality control to design, develop, and implement the new case management and tracking system. “We’ve created what we believe to be the new industry standard for best practices in managing investigations,” said Catherine DeLeonardis, USIS director of information security and business systems. Effective January 1, 2007, Colorado became the first state in the U.S. to impose employment verification obligations on all employers, adding new state requirements to the existing federal statutory scheme for completing I-9 forms and inspecting work authorization documents for all new hires. (A.B.-S1017, passed in August 2006) The Colorado statute requires that, in addition to I-9 requirements, all Colorado employers keep copies of employment authorization documents submitted by new employees during the I-9 process and that the employer (or its representative) sign a special "affirmation" confirming his/her inspection of the legal work status of new employees. More information about the Colorado statute is available at The Colorado Department of Labor and Employment. Since publication of Colorado Department of Labor (DOL) questions and answers about A.B.-S1017 on December 26, 2006, it appeared that the Colorado DOL, charged with enforcement of A.B.-S1017, read the statute to require "legal work verification" steps more onerous than those required by federal law, by suggesting that compliant employers should enroll in the Social Security Basic Pilot program or use the Social Security payroll verification system "SSNVS" to confirm a new employee's social security number. Many employer representatives, including Littler attorneys, urged Colorado officials to reconsider this position. Employer representatives argued that the Colorado DOL exceeded statutory authority and the use of the Social Security SSNVS program for work authorization purposes is contrary to federal Social Security guidelines strictly limiting access to and use of that data. As an enhancement to its employment eligibility verification (EEV) program, Basic Pilot, the US Department of Homeland Security's (DHS) Bureau of US Citizenship and Immigration Services (USCIS) has launched a new pilot for employers to compare Lawful Permanent Residence cards (i.e., green cards) and other employment authorization documents containing photographs presented by new employees during the hiring process to the official photographs stored in DHS databases. "This enhancement to the Basic Pilot Program adds another level of security for employers during the hiring process and sets the foundation for continued technological improvements," stated Christopher Bentley, a spokesperson for USCIS, in an interview with CCH. Tool Pilot Program has the participation of 48 companies and is scheduled to last three months. The Photo Screening Tool Pilot was created out of demands from employers for a greater level of technological capacity in Basic Pilot. "Putting a biometric component into Basic Pilot is the next evolutionary step to enhance the program," stated Bentley. The aims of the Photo Screening Tool Pilot are to ensure that the process is not burdensome for employers and easy to use. 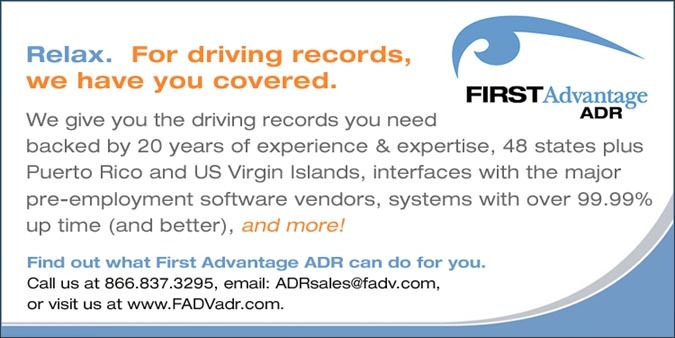 We are committed to finding new and innovative ways to create additional sales opportunities for you. Stay tune for more exclusive Platinum web sites focused on driving more traffic to you. Today, the concept of risk management is so fundamental that most large organizations dedicate entire departments to assessing factors that create risks of financial loss or physical injury. The first job of risk managers is to identify conditions that increase the likelihood of a damaging event. If the concern is fire, for example, they would focus on overloaded electrical circuits and sloppy handling of flammable substances. The second aspect of risk management is reducing the harm in the event of a fire. Requiring sprinklers and firewalls reduce the risk of damage. If we`ve learned anything from the last few years of unrelenting budget-breaking, reputation-damaging, energy-diverting scandals, it`s that people with weak character or bad judgment constitute a far greater jeopardy than fires. Thus, treating good character as an essential job competence is an important and potent risk-management strategy. Unfortunately, in a litigious environment dominated by fears of getting sued, many companies neither seek nor give comprehensive and candid background information on new employees. That`s a great mistake. If one has to choose, hire for character and train for skills. This means developing a robust program of screening and weeding. First, spend more time ascertaining the character of job applicants through background checks and require them to sign a waiver authorizing their former employers to disclose all relevant information. Cross-border information flows between economies around the Pacific Rim are dramatically increasing in volume as IT businesses globalize their information processing services via the Internet. "Supply and distribution chains are becoming more globally integrated," said Joe Ahladeff, Oracle's Vice President of Global Public Policy, who spoke at the opening session of the First Technical Assistance Seminar on Cross-Border Privacy Rules (CBPRs) in Canberra, Australia held on 22 23 January. "The Internet has created a global marketplace that drives both price and service competition across regions. Consumers are freed from reliance on local vendors." Due to the importance of protecting personal information and the proliferation of e commerce, the APEC privacy initiative was launched to include the development of the APEC Privacy Framework and seminars to help economies implement privacy law. In their 2006 Annual Statement, APEC Ministers emphasized the need to ensure "responsible and accountable cross border information flows and effective privacy protection without creating unnecessary barriers." IS BRITAIN BECOMING A NATION OF LIARS? Research undertaken by BackgroundChecking.com, an Experian® company, has revealed an alarming level of dishonesty amongst the British workforce which starts the moment a candidate applies for a job. Of the 1,003 working adults questioned who admitted that they would consider falsifying information on their CV, the vast majority (87 per cent)* said that if they knew that companies thoroughly checked all details on a CV, it would act as a deterrent to falsifying any information. Yet, 66 per cent of people do not believe that employers thoroughly check the details on all CVs and job application forms. Perhaps more alarmingly for businesses, if it was thought it would to go undetected, 39 per cent of people would lie on their CV and a worrying 42 per cent of those questioned claim to know individuals who have falsified information on their CV or on application forms. London - As Britain moves towards running criminal checks on everyone who volunteers with children, a civil liberties group has warned that the step could strangle the nation's youth groups. From late 2008, every adult who volunteers in any sort of youth-related activity - such as coaching sports teams or after-school clubs - will be compelled to undergo a criminal records check. The government is already encouraging this practice, and when the new regulation goes into force, anyone found working with children without having being checked will face a $10,000 fine. Across the country, dozens of organizations that work with children are currently vetting their members, including the Football Association, which is reportedly checking around 20,000 coaches and referees in youth soccer leagues. Passed two years ago as a reaction to a number of child care scandals rocking the country, the Safeguarding Vulnerable Groups Act has been hailed by supporters as a law that will make parents feel more secure. But opponents say it will chill the interaction between adults and children. It will also mean that up to one-third of British citizens will have to be vetted by the government. Toronto, - DriverCheck Inc., the Canadian leader in drug and alcohol testing in the transportation industry, and ISB Inc., the Canadian leader in source document acquisition, are pleased to announce the launch of ICHECK(TM), a program that provides a single source for all customers to obtain drug and alcohol testing and pre-employment screening services. Through ICHECK(TM), DriverCheck clients and the Canadian transportation industry in general can now access a full suite of pre-employment and ongoing-employment background checks such as criminal records, driver abstracts, CVORs, credit checks and previous employment verifications, among other documents and services. In addition, ISB now offers a full suite of drug and alcohol testing to current and future ISB customers through DriverCheck. Will traditional data protection applications survive the demands for ultra-high availability and the growing requirements for nearly instantaneous recovery? In this paper, data protection expert Fred Moore of Horison Information Strategies explores today’s backup and recovery strategy options, comparing traditional methods, such as Backup, Disk Mirroring, Snapshots, CDP, and VTLs. What are the trade-offs associated with each and, more important, how do new data deduplication techniques change storage economics and impact data protection decisions and purchases? Data recovery options must align with application and business requirements to yield the highest availability. Creating a full backup to tape is no longer economical nor does it provide the highest availability when compared to next generation solutions. Included is a checklist with considerations to make this task easier. The first one is for an Operations Manager and the other for a Sales Executive, both with competitive compensation packages. 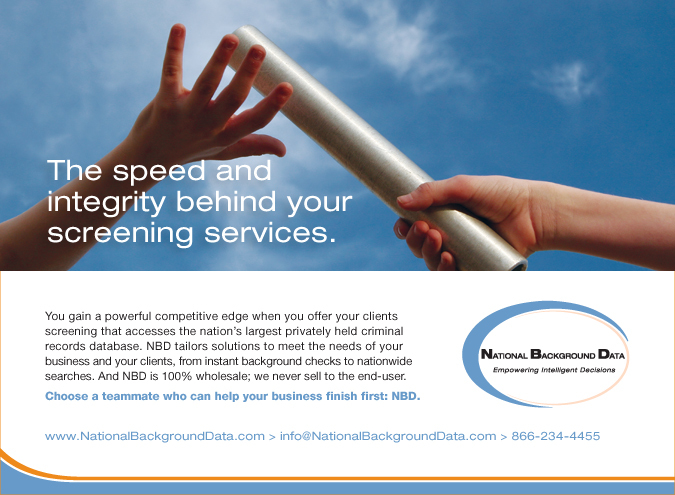 Visit the website for details on these great opportunities at a good size background screening company. Click the above link to see these new job postings or to review the 18 job seekers' resumes waiting for you. For any additional information contact Cindy Sullivan of Berg Consulting Group at 561-712-1277 extension 5#.